All divorces end by either settling or going to trial. While the vast majority take the former route, settlement is not always the best or most appropriate option. Determining whether to settle or to take your case to trial can be a difficult decision. Here are some questions to consider when making your decision. How fast do I want my case resolved? If completing your case as soon as possible is important to you, then settlement may be favorable to trial. How much money am I willing to spend on my case? Trials can add a significant cost to your case in terms of legal fees. However, these costs should always be weighed against the cost of a poor settlement agreement. How important is it to me to tell my side of the story? If being able to share your case publicly with a judge is important, then trial will provide the only avenue to do so. How much stress am I willing to take? Going to trial is stressful. It is important to weigh your tolerance for stress before choosing to do so. How much do I stand to gain or to lose by going to trial? Is it worth it to go to trial? Your attorney can help you to assess the possible outcomes of trial to help inform your decision of whether to settle. How well could I live with the worst-case scenario at trial? If the worst case happens at trial, will you be able to live with that outcome? How will my relationship with my ex-spouse be affected? Trial is an adversarial proceeding, where emotions often flare. If you need to maintain a relationship with your spouse beyond divorce, it is important to consider the impact of trial on your relationship. While settlement provides certainty, trial inevitably provides risk. Sometimes the risk is worth it—but how capable are you of tolerating that risk? What are my chances of succeeding at trial? Your attorney should provide advice regarding what the likely outcome of trial could be in order to help you to weigh your options. Am I willing to forgo my right to a trial? The outcomes of your divorce are often permanent. 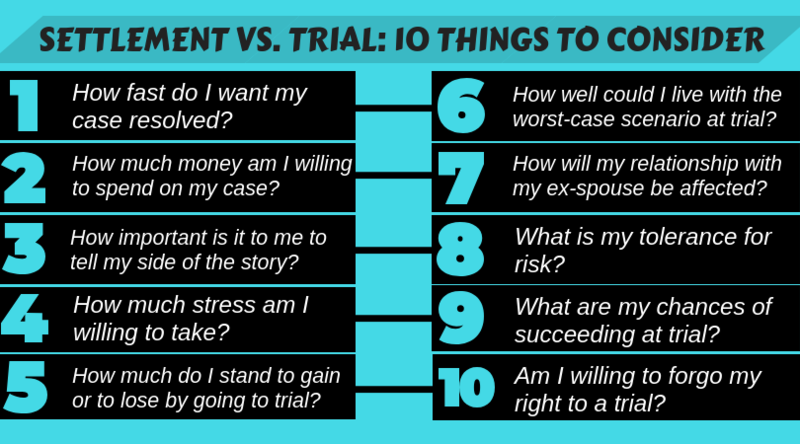 Are you willing to accept these outcomes without invoking your right to a trial? Determining whether to settle or advance to trial is not an easy decision nor one to be taken lightly. Your legal team at Koenig|Dunne is here to provide you with guidance and advice regarding this difficult decision and all of the decisions that you will face throughout the divorce process.